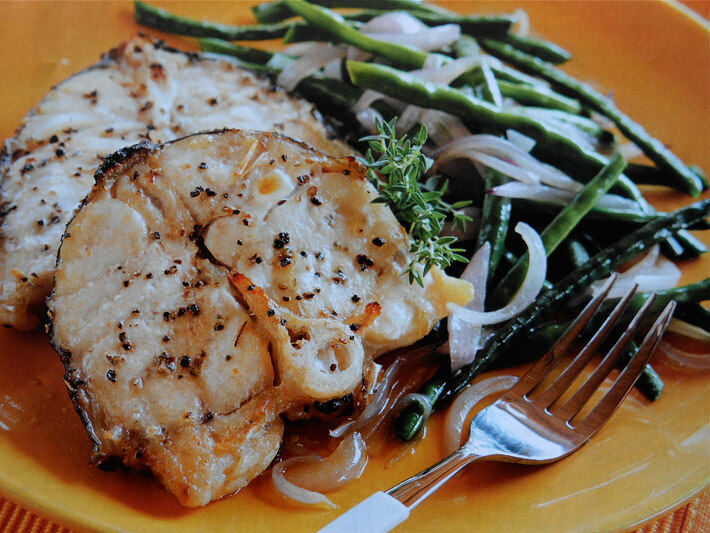 Grouper is a very low-fat, firm white fish. Its wonderful mildness matches perfectly with the distinctly delicate flavor of Yard-Long string beans. Cousins to the black-eyed peas, these string beans are very similar to common green beans, but have a sharper and crunchier texture. They also contain very high levels of vitamins A and C as well as a very good source of Folates. 1. Bring a pot of salted water to boil. 2. Add string beans and cook for about 10 minutes. 3. Remove beans and place them in a pot of iced water to seal in bright green color. Drain well and set aside. 4. In a pan, heat 5 tbsp. olive oil on medium/high heat. 5. Sauté the onion slices for about 5 minutes, stirring constantly. 7. Season to taste with salt and pepper. Set aside. 8. Preheat the oven grill and brush each fish steak on both sides with the remaining olive oil. Add salt and pepper. 10. Serve with the string beans and enjoy with a Riesling d’Alsace wine.